Christmas is almost here and we’re sure many of you want to play some funny Christmas games on your computers. We already posted a list of the 5 best Christmas games to play on Steam. Today we’ve got another surprise for you: a list of the best Christmas VR games to play this December. Kids and adults alike love snowball fights. Merry Snowballs is a funny game that allows you to relive your childhood snowball fights without freezing your hands off. Stay alert and watch out for those frosty projectiles coming at you. At the same time, try to hit your targets as best as you can. Theo, Blondie and Big Joe, the next-door kids will throw snowballs at you all the time, and they’ll definitely give you a hard time. Merry Snowballs lets you use room scale to duck, take cover, attack and parry snowball attacks. You can purchase the game for $14.99 from Steam. “I hate Santa” is another cool snowball fight game you can play this winter. You can start your own snowball fights from the comfort of your house and shoot, dodge, and level up to defeat crazy kids in epic fights. When you finish this game, you’ll find out Santa’s darkest secret. You can also compete against other players and see who the best snowball fighter is. Play hard and make sure you get the first place on the leader boards. You can purchase “I hate Santa” for $2.99 from Steam. If you like quizzes and winter, this is the right game for you. 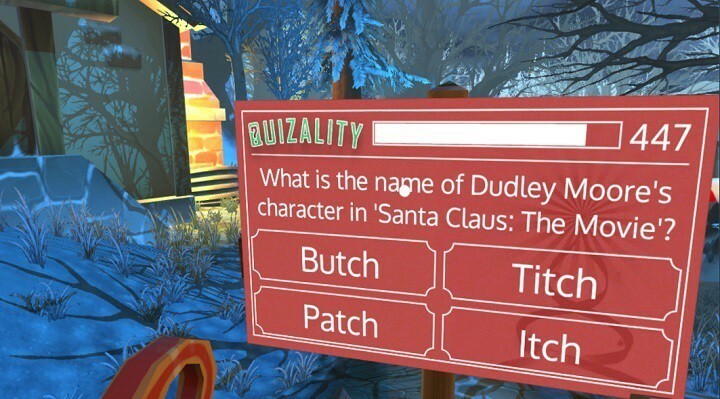 Quizality Christmas Edition is a single player multiple choice quiz set in a VR Winter Wonderland. The difficulty increases as you progress through the game. Embark on a sleigh journey through a winter wonderland and answer questions on Christmas movies, music and trivia. You can get Quizality Christmas Edition as an Early Access game from Steam. Have you ever dreamt of becoming Santa Claus for a day? If the answer is yes, Santa Sling is the right game for you. Santa Sling is a casual first-person VR game where you play as Santa delivering presents to kids from your sleigh in a Christmas-themed town. Sounds all too easy? Well, you need to use your magic slingshot to target chimneys before Christmas Eve ends. Earn bonus points by launching the presents through the rings. And hurry up! Kids will be really upset if you don’t deliver their presents on time. Download Santa Sling VR from Steam. Well, if you’re a zombie game fan, we’re sure you’ll enjoy playing Christmas Massacre. Evil snowmen are going to attack you all the time and you’ll need to blast them with lethal Christmas tree ornaments, candy canes and snowballs. Playing this VR shooter is not as easy as you might have thought. You’d better grab a gun in each hand if you want to stand a chance against the vicious hoards of snowmen. Keep an eye on the cash as well. 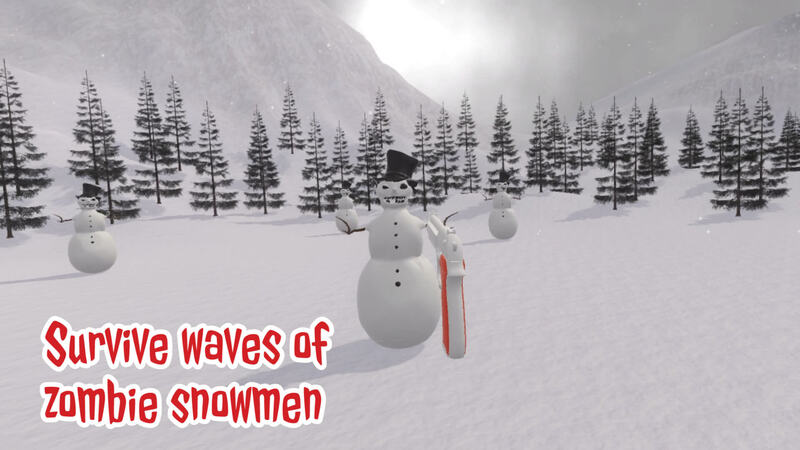 The more you collect throughout the waves of snowmen, the quicker you can upgrade your weapons. Get Christmas Massacre from Steam.